The world’s first friendship election! Appy and Grappo are fighting the world’s first friendship election. Check out AppyvsGrappo for their manifestos and well, parties. Just in case you want to know them better, befriend Appy and Grappo on Facebook. I voted for Grappo. Who do you find fizziest? On popular demand, here is the creative for Eye Bank Association that has won at Goafest 2009 and got an in-book at D&AD 2009. The works are titled Hindu, Christian and Parsee respectively. And if you havent pledged your eyes as yet, you might want to send that coupon to Eye Bank Association Kerala, CBM Opthalmic Institute, Little flower Hospital & Research Centre, Angamally – 683 573, Kerala. This is our latest film for LMN – The Emergency Lemon Refresher for Parle Agro. Directed by Ram Madhvani and shot around Mumbai, film is already winning accolades around the world. Shots did an article on it. The article has few exclusive behind the scene shots and sketches. You might want to watch this video on Shots website too. Appy Fizz’s cousin is here. Welcome Grappo Fizz to the Parle Agro family. He is on look out for new friends on Facebook. And for the boring people interesting in details and news, releases on Business Standard, Hindu Business Line and FnB news might help. Parle Agro launched the most premium juice experience India has ever seen. We worked on the name, design, packaging and communication for the brand. Oh, by the way, if any one wants some samples of Saint, please send in your mailing addresses. And a standard disclaimer – offer till stock lasts. Saint Juice has already found fans. The press. Campaign India, e4m have already carried stories. The Man. The machine. ‘The’ Appy Fizz is back! The Man. The machine. ‘The’ Appy Fizz is back! And how! This time around, Appy Fizz sports a new look designed by the lovely ladies at University of Design. And what an interpretation it is – a cool new t-shirt for Appy Fizz. The side of the pack is almost like Appy Fizz’s facebook profile. With his likes, dislikes, one-liners and causes that he supports. It’s a neat bottle to pick up if you wanna catch a few laughs. He’s already getting eyeballs and media is all over him. Check out what exchange4media has to say about him. But the funnest bit was the commercial that we shot for it. In the commercial, Appy Fizz reveals his new look inside a supermarket. He dances, jumps and flies – things that Appy Fizz has never tried before, and all this while being the perfect show-off. Of course, he almost p#$*&d in his pants while doing the flying shot. Working with Rajesh Krishnan and MFX in Malaysia, it was one of the most challenging shoots ever. It even involved action directors from Bollywood for the flying sequence inside the shop. 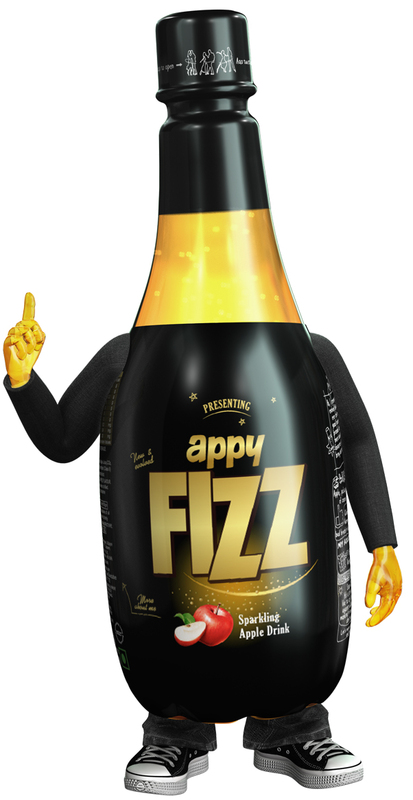 Appy Fizz’s abode will also be online shortly at www.appyfizz.com and a couple of new Appy Fizz Videos will be online as well (remember The Cricket Song and Donate your Ice?) Oh, and we also received our Cannes certificates for the two Appy Fizz ads that were shortlisted! Looks like fun times ahead for Appy Fizz. Not to mention, for us too!